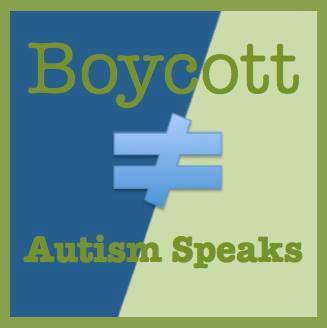 I Boycott Autism Speaks because I am Autistic and I value my life.I Boycott Autism Speaks because I value all lives. Autism Speaks is a hate group that uses marketing strategies to deceive the public and sell their “product”.The biggest problem is that this “product” is toxic and damaging, and it hurts Autistics. It also hurts families.The cost appears to be minimal. After all, the very smart – albeit deceiving – propaganda only tells the public about how life can be so much better if Autism Speaks can have more money. I Boycott Autism Speaks because I do listen to the derogatory and hateful words the organization uses when referring to me. I listen to them and I know their meaning. I also know that the savvy strategists behind Autism Speaks use the same words as dog whistle, reaching people through their emotions, through subliminal messages. Once Autism Speaks has their attention, it plays with their fears of misguided assumptions. Autism Speaks was founded by Suzanne and Bob Wright after their grandson was diagnosed Autistic. They say that it is about love. Their actions say it is about hate. Very rich, very privileged family could not accept that a member of the clan was, according to their – wrong – idea of worth, “broken”. They could not accept that all their money, power and influence could “fix the tragedy”. For ten years now, the Wrights have been saying that they love their grandson, while blaming him for the family’s worries and unhappiness. Pretending they don’t resent the kid’s existence, they turn their hate to the Autistic community, our friends and parents allies. But their disdain for the young child is visible: the family does not allow the kid to participate in family vacations, for example. They segregate him away from everyone, surrounded by empty, sad luxury. I Boycott Autism Speaks to educate parents about the dangers of supporting this hate group because my understanding of parenting is that a child must be respected, accepted and supported. A parent’s job is to love the child for who the child is. Children are not born to fulfill parent’s expectations. Children are born to live the best life. Parents are supposed to work hard to provide this. It is not a child’s work to make a parent happy, according to such parents’ idea of perfection. Autism Speaks tells parents that the child needs to be “modified”, or segregated from life, in order to fulfill that elusive idea of perfection. It tells parents that their feelings are more important than the child’s sense of worth. I Boycott Autism Speaks because the organization works tirelessly to find a way to make sure no Autistics are ever born again, while failing to condemn murderers of Autistic people. I Boycott Autism Speaks because I love my life. I Boycott Autism Speaks because I love living.